February | 2013 | Keep It Up, David! Hey Folks! Now that Richard Simmons’ new infomercial has seen the light of day, I can share some fun behind-the-scenes scoop about the whole experience. Before I do that, a big thanks to everyone that tuned in! For anyone that doesn’t know what I’m talking about, Richard Simmons just launched a new 90-day weight loss program called Project H.O.P.E., and I’m featured as a weight loss success story in the new infomercial! For everyone that missed it, I don’t have any information for you about how you can watch, unfortunately. I’m not in the online version of the infomercial (which can be seen here), and I don’t know if the 30-minute version that I’m in will ever appear online. As for television viewing: I’d like to think that this infomercial, just like every other infomercial ever made, will run for months and months and be inescapable. I just don’t have, at this time, any more scheduling information. What that means is that you should stay up late and watch cable TV in the middle of the night for the foreseeable future until you happen to catch it on the airwaves! Kidding, of course. If I learn more about concrete viewing opportunities, I’ll be sure to let you know! In the meantime, you can live vicariously through these photos. TV Schedule For Richard Simmons’ New Infomercial – Featuring Me! Just a quickie post to share some vitally important, life-or-death information: the air times for the new infomercial I’m in! Richard Simmons is launching a new 90-day weight loss program called Project H.O.P.E., and he’s selling it via infomercial, and the infomercial started airing this week. What’s more, I’m in it! I’m not in it for long, but I provide a testimonial as to the benefits of working out with Richard long term. Here are the channels and times you can watch it this weekend – get ready to stay up late, wake up early, or set the DVR! If you wanna look for it in your TiVo/DVR guide, search for “Richard Simmons’ Fat Blast.” I’m sure it will air many, many times after this weekend, but I don’t know if I’ll have access to those schedules. So grab some carrot sticks and hummus, settle in, and enjoy! 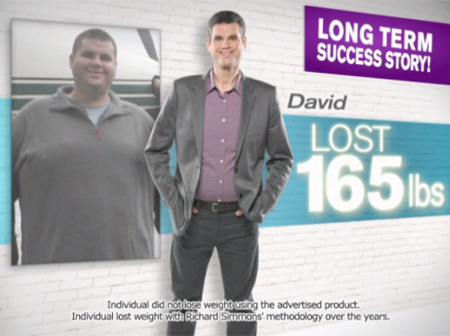 I’m featured in a photograph touting my weight loss at the beginning, and I can be seen in footage filmed at Slimmons towards the end, but my shining moment, from the interview they shot with me, is right around 15 or 16 minutes in (the infomercial is 30 minutes total). The interview was conducted in early December, and I’ll share some photos and stories from that day in another post. 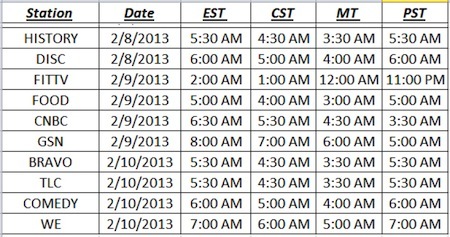 For now, take note of the schedule, and plan accordingly! Oh, and as of right now, my interview isn’t available online. There’s a 7-minute infomercial on YouTube and the Project H.O.P.E. website, but I’m not included in that shorter version. All the more reason to tune in this weekend! My legs are still sore from last night’s workout. It was the best workout I’ve had in a while, partly because I pushed myself, and partly because it happened in a very cool new location. That location is called the St. Andrews Stairway, and it’s actually not very new at all. 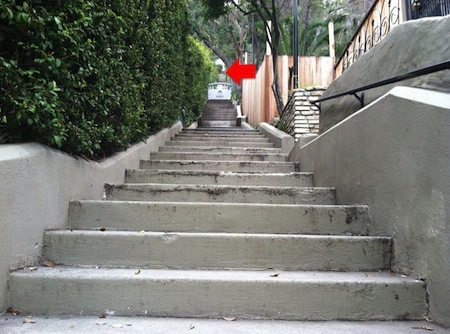 Back in the 1920s, a public stairway was built up the side of the Hollywood Hills, to allow residents on higher streets an easy way to come down to catch the streetcars that used to zip around Los Angeles (hard to believe, but back in the day LA used to have one of the largest public transportation networks in the country). The stairway is cleverly called the St. Andrews Stairway, as it starts at the end of St. Andrews road. Despite it being there for nearly 100 years, I didn’t know it existed, even though last fall, I ran right past it during an evening run. It didn’t catch my eye during that run because it wasn’t lit at night, but that changed last month. I read online a few weeks ago that some 8 or 9 decades after initial construction, the city of Los Angeles finally made good on their promise to install streetlights on the St. Andrews Stairway, and I realized that it was relatively close to my office. So last night, I laced up my running shoes and went for a run. And even though I’ve only been twice (once last night, and again today to take some photos to share here), I’ll come out and say it: I love the St. Andrews Stairway! There are 153 stairs (I counted myself). That’s basically a 10-story building! Here’s what they look like from the bottom. The arrow is pointing to the wall at the very top of the stairs, all the way up on Tryon Drive. You are currently browsing the Keep It Up, David! 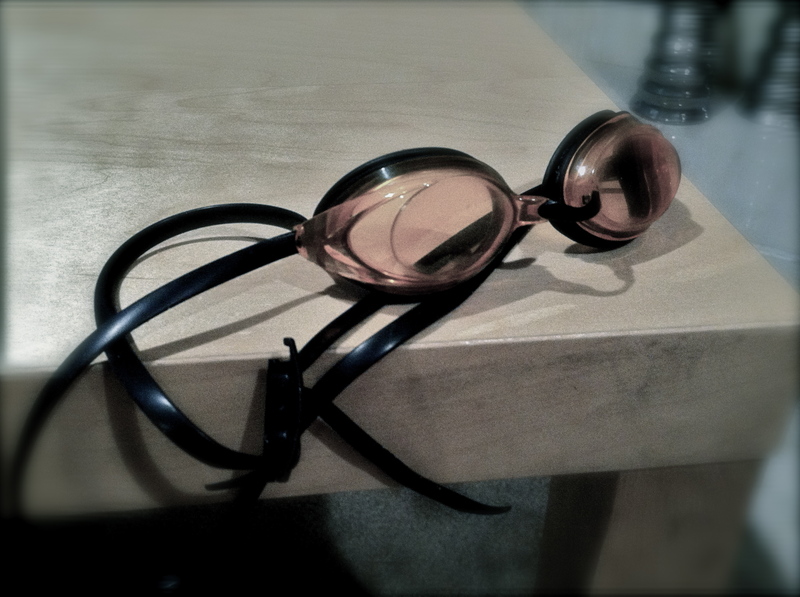 blog archives for February, 2013.